Versital offers bespoke made to order marble panels and marble tops in a range of colours, and are often approached to create bespoke items for high end projects. Redd Europe is a UK based design and display company, creating brands and point of sale display equipment for high end and luxury brand products worldwide. 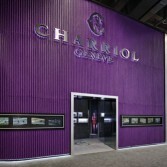 Redd’s latest project involved designing and manufacturing point of sale display cases for high end watch brand ‘Charriol’ to be used at the luxury watch show ‘Baselworld’ held annually in Switzerland. The brief included the use of sumptuous finishes and colours such as velvet, high gloss royal purple, marble panels and marble tops to showcase the luxury watch brand. They chose popular white and black marble finish ‘Arabesque’ from Versital for it’s opulent appearance, to showcase the watches at their best. Versital offer a wide range of solid surface products, including bathroom surfaces such as shower panels, shower trays and vanity tops. For commercial customers Versital offer bespoke products for point of sale including made to order marble panels and tops in a wide range of natural look granite, marble and modern sparkle finishes. To find out more about Versital surfaces and bespoke solid surface solutions call Versital direct on 01204 380780.